Invest Hong Kong (InvestHK) hosted a seminar in Jinan, Shandong Province, today (June 22), introducing Hong Kong's unique business advantages to local companies under the national Belt and Road Initiative and how they could leverage those advantages to access overseas markets through the city. The seminar, entitled "Hong Kong: Regional Business Hub and New Opportunities for Mainland Enterprises", was organised by InvestHK in partnership with the Trade Office of the Economic Affairs Department under the Liaison Office of the Central People’s Government (LOCPG) in the Hong Kong Special Administrative Region (HKSAR) and the Department of Commerce of Shandong Province. It was also supported and co-organised by the Hong Kong Economic and Trade Office in Shanghai of the HKSAR Government. The Deputy Director-General of the Economic Affairs Department and Head of the Commercial Office of the LOCPG in the HKSAR, Mr Liu Yajun; the Deputy Director of the Department of Commerce of Shandong Province, Mr Zhang Weike; and Associate Director-General of Investment Promotion Mr Francis Ho delivered remarks at the event. In his speech, Mr Ho stated that Hong Kong has been an important economy and trade partner as well as a key conduit of foreign investment of Shandong for many years. Shandong is focusing on developing its modern service industry, which is aimed at upgrading the international level of local enterprises. He said, "Under the National 13th Five-Year Plan strategy, Shandong is speeding up its industries' transformation and upgrading amid the Belt and Road construction opportunities, as well as accelerating the globalisation process by expanding its domestic and international co-operation via Hong Kong. All these initiatives have created new opportunities for Hong Kong and Shandong. Hong Kong can play a key role in areas such as financial and logistics industries, infrastructure investment and financing, and serve as a trading hub offering a dynamic business environment for Shandong companies to embrace the new opportunities arising from the Belt and Road Initiative." He added that Hong Kong enjoys "super-connectivity" under the "one country, two systems" arrangement. He said, "Hong Kong has been ranked the world's most competitive economy for two consecutive years by the International Institute for Management Development, and the world’s freest economy by the Heritage Foundation for 23 consecutive years. As an international city in Asia, Hong Kong offers effective financial, insurance, accounting, business and legal services, all of which go together to create a comprehensive and modern service industry platform. It can act as a 'super-connector' between Mainland China and the rest of the world. Under the Belt and Road Initiative, Mainland enterprises can continue to make use of Hong Kong’s various advantages to 'go global'." 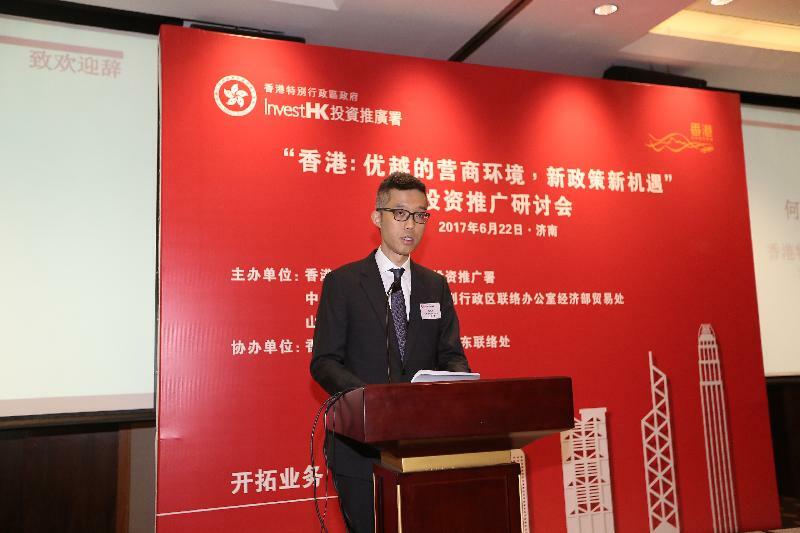 The Head of the Shanghai Investment Promotion Unit of InvestHK, Ms Ada Yeung, also spoke at the seminar, introducing Hong Kong's business environment and ways to "go global" under the Belt and Road Initiative. She highlighted the various types of free services InvestHK can offer to Shandong companies. Other speakers at the seminar included Senior Manager, Mergers & Acquisitions, Tax, KPMG, Mr Winson Chan; the Head of the Global Capital Financing Department of Industrial and Commercial Bank of China (Asia) Limited, Mr Yang Fan; and the Secretary of the Board of Inspur Group Co Ltd, Mr Lu Wenjie. Each provided the latest updates on Hong Kong’s advantages as a corporate treasury centre, spoke on core strengths in the financing platform and also shared an enterprise case study, and encouraged Shandong enterprises to make use of Hong Kong’s platform to expand overseas. InvestHK is the department of the HKSAR Government established in 2000 to attract foreign direct investment and support overseas and Mainland businesses to set up or expand in Hong Kong. It provides free advice and customised services to help businesses succeed in Hong Kong’s vibrant economy. For more information, please visit www.investhk.gov.hk. For an event photo, please visit www.flickr.com/photos/investhk/albums/72157682264701312.